What Should I Do if Someone Rear Ended My Car in Fayetteville, Georgia? Rear end collisions are all too common. They often result from drivers texting while driving or being otherwise distracted. Tailgating is another common cause of rear-end car accidents. In some cases, rear-end collisions occur due to unforeseen circumstances, like harsh braking due to an animal crossing or debris on the road. 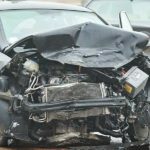 Whatever the reason for the collision, if someone rear ended your car, you will want to contact a Fayetteville, Georgia rear-end collision attorney right away. What should I do after a tailgating car accident? The good news is that if someone rear-ended your car, they are almost always going to be found at-fault for the accident. This enables you to collect damages to cover medical expenses, lost wages, and more. However, to recover these damages, you need to properly document everything and build a strong case. Immediately after an accident, you should inform the police. They will come to the scene and document everything. Obtain a copy of the police report for your records, but also gather your own information. This includes the driver’s name and insurance information, any witness statements from the accident, and photos of the damages. You will also need to seek medical attention right away. Either have Emergency Medical Services come out to the sight or visit your primary physician right away. Any injuries sustained need to be documented right away. Should I contact my insurance company or theirs after a rear-end collision in Fayetteville, Georgia? If you are in a tailgating auto accident, you should alert both insurance companies. Even if the at-fault party wants to handle the case without involving the insurance company, you should notify them. This protects you down the road if the other driver doesn’t pay or is impossible to get ahold of. Auto insurance exists for a reason, and you should contact both insurance companies right away to make sure you are protected if rear ended and injured. What should I do if I the person who rear ended me has no insurance? Rear-end collisions are common. In fact every year, approximately 1.7 million of these accidents occur in the United States. Unfortunately, not all of these cases involve an at-fault driver who has insurance. Even though it is mandatory to have automobile insurance on a vehicle operating in Georgia, there are still drivers that take the risk. If someone rear-ended your car and they don’t have insurance, there are still ways to recover damages. Unfortunately, in these cases, you will generally have to go after your own insurance company to cover any damages. If you have uninsured or underinsured motorist coverage, you will be protected if the other driver is at fault. It is important to note that there is often a short timeframe for filing these cases, so you should contact a tailgating car accident lawyer as soon as possible to review your case. If the insurance company agrees to pay me, do I need a lawyer? Let’s put it this way, the insurance company has their bottom line and not your best interest at heart. They want to quickly settle cases that come across their desks and often require you to sign agreements prohibiting you from suing at a later date. Yes, $50,000 or whatever they agree to pay might seem like a lot of money, but what if you end up missing months of work and have prolonged physical therapy to rehabilitate your injuries are a tailgating car accident? Suddenly, $50,000 doesn’t seem like all that much does it? In fact, you might not even realize how quickly you will go through that money. The experienced rear-end collision lawyers at the Wade Law Office know tailgating accidents insider and out and will fight to get the compensation you deserve. We will aggressively fight for you, keeping your best interests at heart every step of the way as we battle the insurance company and at-fault driver. Read end collisions are one of the most common types of car accidents, and the damages and injuries that result from them can be significant. If you were injured in a tailgating car accident, contact the rear end accident attorneys at the Wade Law Office today for a free consultation. We will review your case and hold the at-fault driver and insurance company accountable for the compensation to which you are entitled.